By the late 1800s AD, the United States and Canadian armies forced most of the people who had hunted bison on the Great Plains to move to reservations. The reservations were on terrible land. They were deserts with no water. And now that the bison had all been killed, people had no way to get food. Many people were sick or starving. The Cree, the Arapaho, the Blackfoot, the Ute, and the Sioux were among these people. Then in 1889, there was an eclipse of the sun. During the eclipse, Wovoka, a Paiute man, had a vision. His vision told him that he was the Christian Messiah, sent to earth to prepare his people to go to Heaven. Soon their suffering would be ended and they would all be happy. Since they were all so unhappy now, this was a very popular idea. 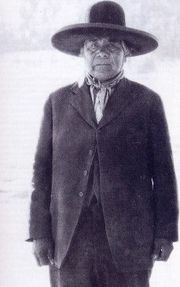 Soon many people came from all of the Plains nations to learn more about Wovoka’s vision. Wovoka told everyone that he had a prophecy about the future. He said that in the next spring, the earth would be covered with tons of new dirt. The dirt would bury all the white people and get rid of them forever. Great herds of bison and wild horses would come back. All the people who danced the Ghost Dance would rise up into the air while the dirt was coming down. Then they would land safely on top of the dirt afterwards, along with the ghosts of all their ancestors. They would all live together and be happy – only Native Americans and nobody else. When the Mormons heard about this new prophet, they came to see him to see whether he was really a holy man or not. The idea of the Ghost Shirt or Ghost Dress may come from Mormon ideas about sacred clothing that would protect you. Many Sioux people, especially women, were dancing the Ghost Dance over and over until they collapsed. The United States soldiers were very nervous about all this dancing. Sitting Bull, a chief of the Sioux, wanted people to stop dancing. But another chief, Kicking Bear, told him that if people wore their Ghost Shirts while they were dancing no bullets could hit them. So people did keep dancing in their Ghost Shirts. The United States soldiers came to arrest Sitting Bull to try to stop the dancing. They shot Sitting Bull and killed him in December of 1890. But after the death of Sitting Bull and other Sioux, who were not protected even though they were wearing their Ghost Shirts, Wovoka’s movement became less popular. Cite this page: Carr, K.E. 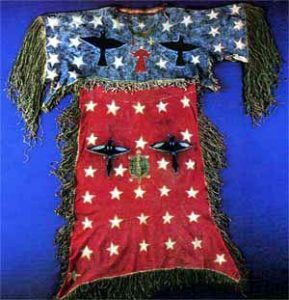 Ghost Dance – Native American religion. Quatr.us Study Guides, August 14, 2017. Web. April 26, 2019.